In tropical countries people often drink pollutedsweet water from lakes, rivers and ground wells. This water often has a bad taste, is contaminated with fine silt and is loaded with harmful bacteria and viruses. It is clear that this type of water seriously impacts the health of especially children, elderly and pregnant woman. 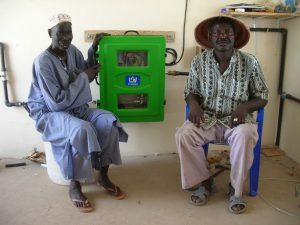 We developed the UV WaterBox for communities ready to battle water problems and purify water easily. The simple device uses a strong UV lamp to kill harmful bacteria and viruses (up to 99,99%). Additional filters reduce bad taste filters out fine grain and silt material. 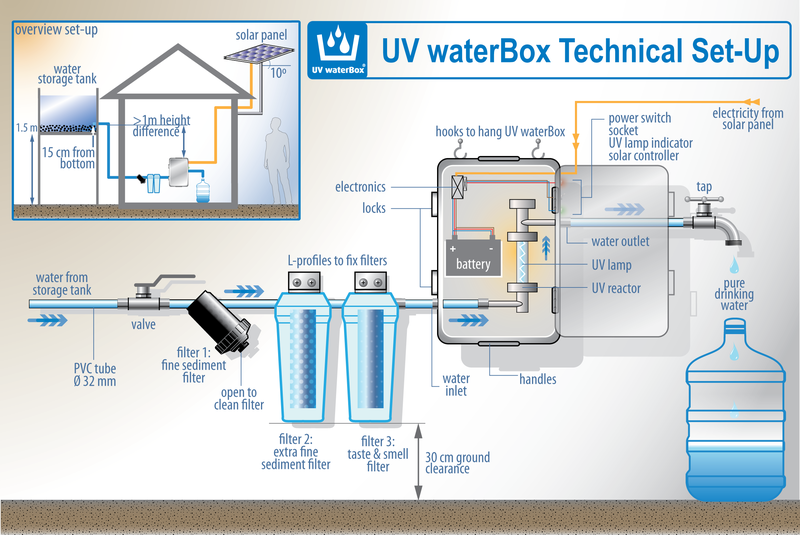 The energy needed to power the UV WaterBox lamp is obtained from a solar panel. 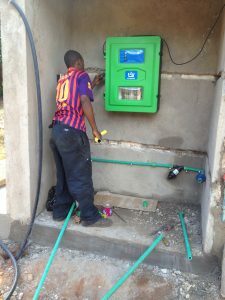 The system is independent of the local grid, can easily be installed, is operated and maintained by a local workforce. Especially suitable in remote places. 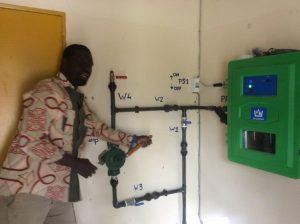 On daily basis 5.000 to 10.000 liters water can be purified dependent on the size of the WaterBox. 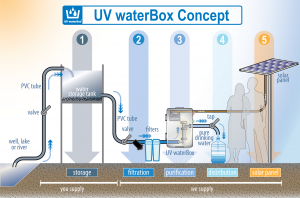 The UV WaterBox serves therefor 1.600 – 3.200 people with clean drinking water, considering 1 person consuming 3 liters of fresh water per day. The core of the WaterBox is a UV lamp in a RVS tube. When the UV lamp is on, the contaminated water is routed through this RVS tube in which UV rays are abundantly present. The rays effectively kill 99,9 % of all the bacteria and viruses present. After the UV treatment the water is safe for consumption. The energy needed to power the UV lamp is obtained from a solar panel. A small battery is added to make sure that the Box operates even when no sunlight is available. The effect of the UV treatment is maximized through the usage of 3 simple filters to remove dirt, silt and sand from the source water. The filters also reduce bad tastes and odors, improving the quality of the output water considerably. Click here (pdf brochure) and here (technical drawing).